There are electric kettles...and there are electric TEA MAKERS. So, what is the difference you ask? Simple...an electric kettle will quickly and easily boil water. How quaint. Unfortunately, an electric kettle is not designed to HEAT water to a specific temperature. Remember, while some teas like herbal teas require boiling water, other teas like green teas require to be at 180 degrees. And with a normal electric kettle which only boils water, well, you are essentially "up the creek without a paddle" when heating water for teas that do NOT use boiling water. And that is where electric tea maker come in. Electric tea makers have been specifically designed to heat water to varying degrees of temperature and/or brew the tea as well...The point it, with an electric tea maker, YOU control what temperature the water will be heated to and are not stuck with boiling water all the time like you are with an electric kettle. Do You Need a Tea Maker? Good question. My quick answer is no. You can brew tea perfectly fine by boiling water in a boring stove top tea kettle, having a tea cup with an infuser (mandatory), and pouring the water over the leaves. And if your tea calls for less than boiling water, just let the water cool a bit before pouring over the leaves. A tea maker, thus, is not "critical" to tea brewing or enjoyment. It is, however, handy to have. In particular, I find the utiliTea Kettle from Adagio Teas to be especially helpful. Gone is the worry about what temperature your water will be...just select, wait a bit to warm up, and you are good to go. It's not an all in one system like the other tea makers are, but as I don't need an all-in-one system, the utiliKettle is ideal. On the other hand, those all in one systems cut down on space, have everything together all in one piece and do make cleanup easier and quicker. Additionally, and in particular with the Breville system, you can really become experimental with your own infusions if you wish. So, whether you need or want any of the products on this page are up to you and will depend on what you have now and what kind of conveniences you like to have. But, I will say this, once you give the utiliTea kettle a try, you won't be going back to boiling water in the microwave or the range top ever again. The products on this page are all available through Amazon.Com and Adagio Teas. Different tea varietals such as Black, Green, White, and Oolong require exact water temperatures and controlled brew times to allow their unique flavors and aromas to develop during brewing. The One-Touch Tea Maker eliminates the guesswork so you can enjoy a perfect cup of tea, every time. Fully programmable for all types of tea, water temperatures, and steep times. The moving tea basket allows water to circulate freely around the individual tea leaves for maximum infusion. Set the timer and wake up to the aroma of your favorite brew. Note : This is a full blown tea maker, and an expensive one at that. 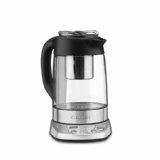 But in the world of electric tea makers, it is considered a premiere product - as all the positive reviews of it on Amazon's site suggests. Green tea lovers no longer have to struggle to achieve the optimal steeping temperature, while darker tea drinkers can still expect impeccably boiling water. With an innovative temperature control system, this versatile device can heat to your preference. At last, an all-inclusive kettle for heating water for the perfect pot of tea. This durable stainless steel kettle is a must-have for tea lovers of all kinds. Made in China. 30 oz (1L). Note : This is a quick, simply and reliable way to brew tea to different temperatures. It ONLY heats water...it is not a all-in-one system. But if that is all you need, this is an ideal way to heat water to a specific temperature. 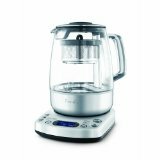 This advanced kettle has precise settings for all tea varieties, making it easy to achieve a water temperature that is ideal for your tea of choice. It also has a "keep warm" feature that will maintain a selected temperature for a half hour. Temperature settings include 150, 165, 180, 195 and 212F. Concealed heating element with boil-dry protection. The water level window is made from Tritan copolyester, a new BPA-free material; black non-metal parts are made from polypropylene. Note : This is essentially an advanced version of the UtiliTea kettle, shown above. Again, to stress - this is not a tea maker. Instead, it is essentially a programmable tea kettle designed to heat water to a number of very specific settings. 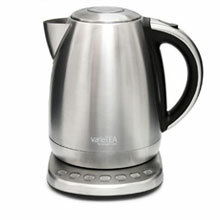 The primary difference between this tea kettle and the utiliTea kettle is that the Varietea kettle is programmable to heat water to more specific temperatures. The UtiliTea kettle only heats to 180F and to 212F, not the additional temperatures that this kettle does. Whether the extra temperatures are worth the extra cost, well, I'll leave that up to you! Looking to simplify preparation of loose tea? Our electric tea maker is the answer. Say goodbye to kettles, teapots and over-steeped cups. This wondrous appliance does it all - heats water, steeps leaves, and keeps tea warm so you may enjoy it all day long. Variable timer and temperature control lets you adjust the strength of an infusion, ensuring a perfect cup of tea each time. Works well with all tea varieties. Note : This is a all-in-one tea maker system. It does more than just heat water to specific temperatures like the utiliKettle above does.